Sometimes lessons come from the most unexpected people. We animal rescuers tend to forget that. Back in 2010, when Freckles showed up at the office--nameless, thin, with puppy-ish long and clumsy legs, and a pleading in her dog-smile that plucked at my heart--people were horrified. They were always horrified: dogs are dirty, yadda-yadda; but this time it was worse. Because, see, Freckles had a French bulldog ancestor somewhere in her past, and along with the cute face and silky fur, she'd inherited the propensity to something called "cherry eye." than a pure-bred French bulldog. She had it bad, pretty much like the dog in the photo above, and she had it on both eyes. It was horrible to see how people backed away in disgust from her. Which wasn't much of a problem for the dog: she backed away from people, too. Even the well-meaning ones. And the threat of Management calling Animal Control was always there. Then a colleague happened to mention she'd been looking for a dog for her kids. After careful questioning to make sure she knew what she was doing when it came to the dog + kids combination, I asked if she'd be willing to give this little one a home if I caught her and took care of the cherry-eye thing. She checked with her husband that afternoon and came back with a Yes the next morning. I brought her kibble every morning to build a routine. I tried to lure her close with food from the cafeteria. She took it from my hand, but backed away as soon as I tried to touch her. Sausage, chicken, even beef. Yes, very grateful for the food, thank you, but no touch. So I made a plan. I'd go on a Saturday, and I'd spend as long as it took--all day, if necessary--feeding her yummy bits until she trusted me enough to let me touch her. But I had no idea how she'd do once we were in the car. The only other "hostile" dog I'd rescued had been tiny compared to Freckles here. Easier to control. My friend Maru volunteered. She was among the few who didn't back away; in fact, she would've taken Freckles home herself if she didn't live in an apartment where pets weren't allowed. Which might've made her the perfect rescue assistant--except she had no experience. Zero. Nada. Never rescued a dog. But we rescuers know good intentions, while not the best, are often the only help we can count on. So I agreed. We met at the office parking lot early Saturday morning with old jeans, ratty t-shirts, a leash and a collar, and a big package of liverwurst. I explained the goal to Maru: earn her trust. No sudden movements, no betrayals. Let her get used to us. Let her come to us. Maru followed my lead for--oh, two hours. Maybe three. Flat on the patio tile, hands slimy with liverwurst melting in the heat. Freckles was overjoyed at this sudden abundance, but was having no part of letting us get any closer. When the liverwurst was about halfway done, Maru became my teacher. "How long are we going to do this?" "I know, it takes a long time. You don't have to stay. I get it, it's boring, and--"
"No, I want to stay. I'll stay all day here with you, all night too, if that's what it takes. But I'm just wondering if we're actually achieving anything." Here's where I began to regret enlisting a non-rescuer. "That's how it works, Maru. We have to earn her trust. If we don't, if we--"
"I get that. Just tell me something. What's the priority? Earning her trust? Or getting her to safety? Because it seems to me we can't do both." And--BOOM. Paradigm shift. The proverbial light bulb went on. She was freaking right. Fifteen minutes later, we had Freckles in the car and we were on the way to the vet. 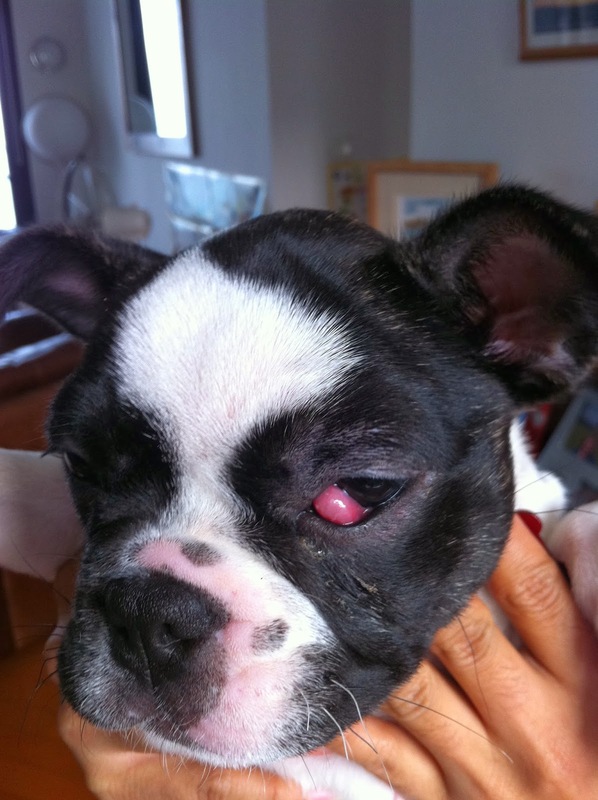 Two days later she was healing from the (super simple) surgery that fixed her cherry eye. Two weeks later she moved to her forever home. Everyone can be your teacher. All you need is to become all eyes and ears. And get off that pedestal of arrogance you've climbed up on.